There really shouldn’t be any need for an excuse to head into Exmoor for a couple of days of cycling. 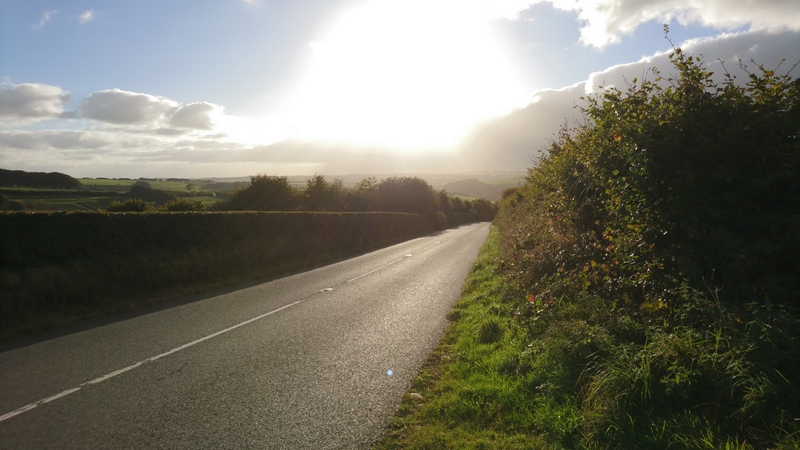 The north Devon & Somerset coasts host some outstanding scenery and provide a multitude of challenging hill climbs. However, for me the underlying purpose of the trip was to tick off some more of those hills in Simon Warren’s book, numbers 3, 4, 5, 6 & 7 in fact. This along with the previous 45 that I’d completed so far would take me up to 50, a significant milestone for any sort of best 100 list! The fact that I could ride this as a two day trip with my cycling mate Phil and include a bivvy overnight by the beach in Woolacombe, made it all the more perfect. 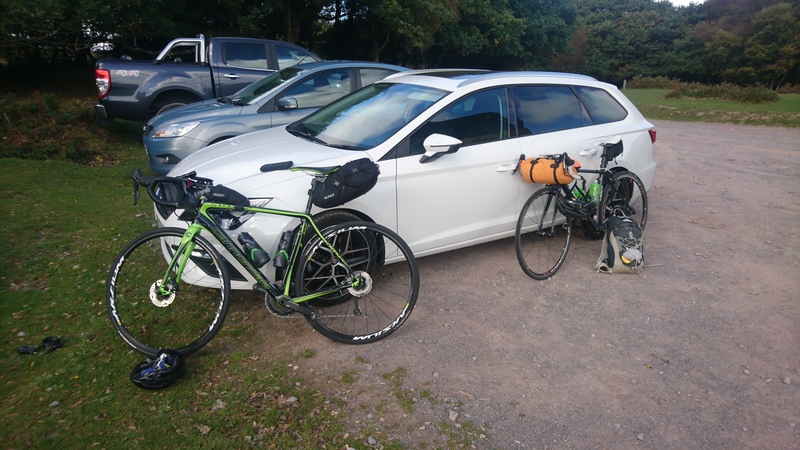 I tagged my ride throughout the weekend on Twitter with #ExmoorEpic but the actually starting point that I’d chosen was not in Exmoor at all but in fact nestled in the Quantock Hills. Up atop the final climb of the second day’s route, Crowcombe Hill, are a series of gravel car parks. Heading from the M5 at Bridgewater the first one you come to is ‘Dead Woman’s Ditch’, a bit of an ominous name from which to start a two day trip but the car park suited us well. It also meant that day 1 started at elevation and allowed us to ride quite a good way before we met our first significant climb; something I’ve been accused of getting wrong in the past! 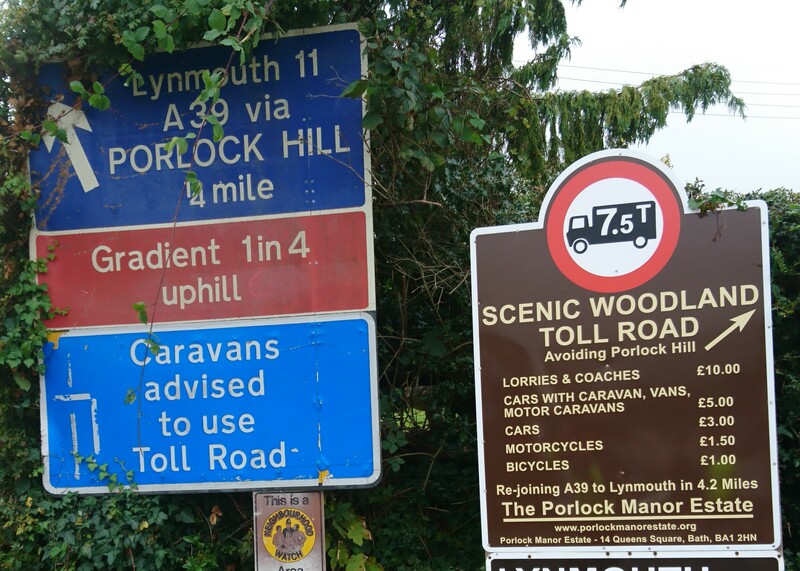 Unfortunately for road cycling there are more hills and fewer roads in the Quantocks and so a stretch along the A39 with the traffic was unavoidable before heading off along the coastal road through Doniford, Watchet and Blue Anchor. 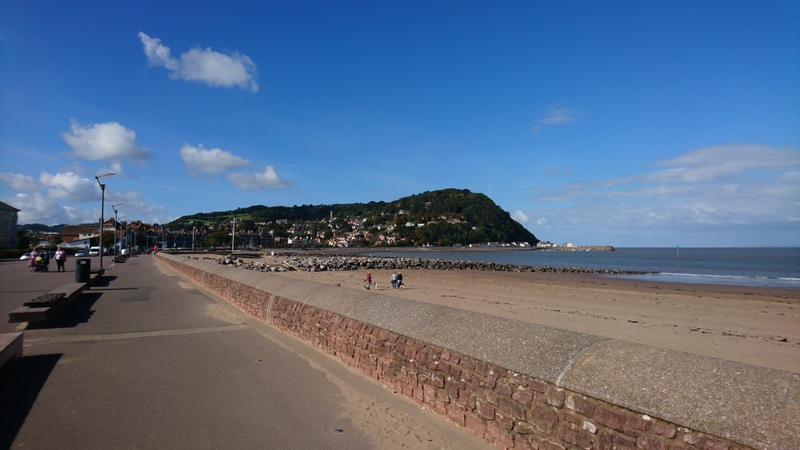 Treated to blue skies as we rode along by the sea fronts we made decent time despite the slight headwind and a short second burst of A39 took us to the turn off to Minehead. On a trip like this you pack what you think you’ll need and try to avoid carrying anything you won’t. Because anything you return back with that was unused has only been extra weight carried for no reason. Of course we’d both packed an inner tube, punctures do happen after all. And one came along on our way out of Minehead, no problem, short stop, inner tube change and on our way. But then the nagging doubt came up that now we were heading further from the car, with no intention of returning until tomorrow and with only 1 spare tube between us. At times like these you sometimes have to just carry on regardless and hope for the best, so that’s what we did. This feeling was heightened slightly, when a short while later, we found ourselves faced with a farmyard and a subsequent off-road section due to a slight mapping error on my part. Ah well, you live and learn. Whoops, my fault, sorry Phil! Any experienced cyclist will know that there are hills and there are HILLS. So far we’d only really come across hills and none of them had made a great impression on us. 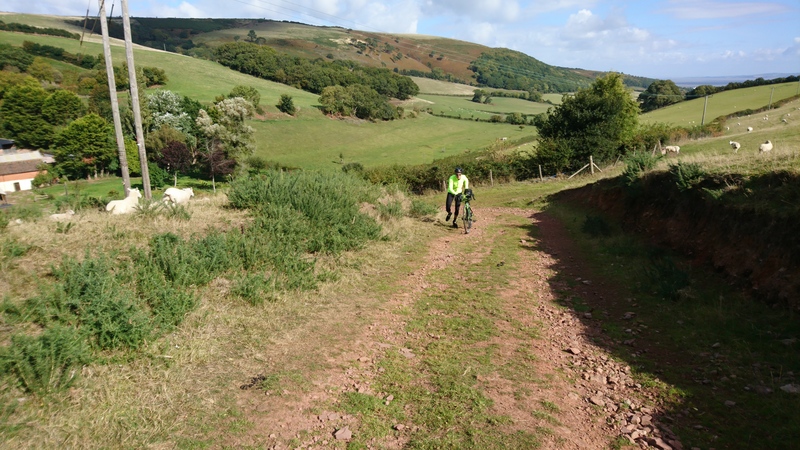 This of course changed when we got stuck into Porlock Hill, #4 on the 100 list and definitely a HILL. Just under 5 km sees you gain 380 m of elevation at an average gradient of 8%, but that’s an average gradient that’s significantly diminished by the relatively gentle upper slopes. It begins at a very nasty 25% as warned on the road signs and for the first 2 km it just keeps biting. But as with all of these climbs, the reward of successfully reaching the top and the subsequent views make it all worth while. From here the A39 is a much quieter road and you could actually follow this all the way on to Lynmouth and it would be quite an enjoyable ride. It would probably also be a slightly less hilly option than the one we took. As it happens we couldn’t have taken the A39 all the way on this occasion because it was closed for repairs and so we had to divert via Brendon and into Lynmouth to get access to much needed water, toilets, coffee and cake via Watersmeet Road. The Bake House Cafe provided us with the coffee and cake and a public fountain beside the public toilets allowed us to fill our bottles. 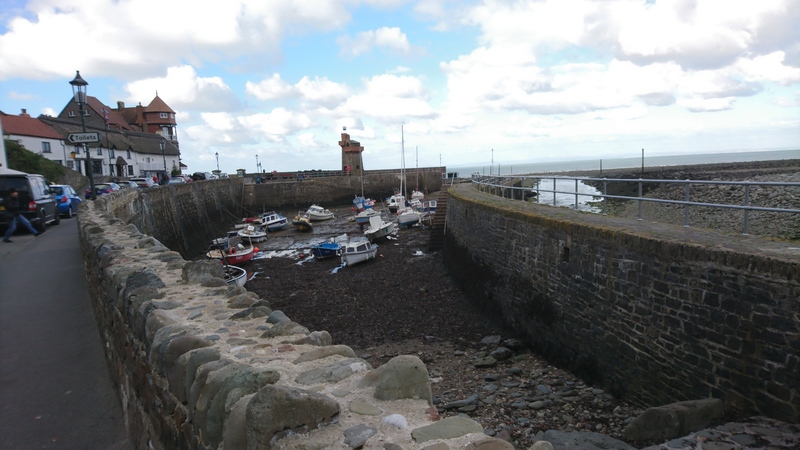 Lynmouth as the name suggests is a village at the mouth of the Lyn rivers (there’s a West Lyn River & an East Lyn River). It’s a quaint tourist village full of cafes, restaurants and gift shops and will be busy during the summer months. It is also nestled in between hills, surrounded on all sides by steep climbs; which in part is what allowed such devastating floods to hit following heavy rainfall in 1952. Our route out of Lynmouth was the same as the route in, up along Watersmeet Road. This is a really enjoyable climb especially the gently rising lower slopes which wind up the hill slowly alongside the West Lyn River, under the cover of the trees. With the drop on your left down to the river increasing with every pedal turn you really get the impression of having gained a lot of height with seemingly little effort. This is the first part of the climb of ‘Exmoor Forest’, #6 in the book and one that I really enjoyed and would definitely like to climb again. The early part is what leads to the low 4% average gradient but it’s not that tame all the way up. After the initial section there’s a left turn onto the B3223 and here the gradient suddenly ramps up. By the end of the climb you’ll find yourself up at 442 m having climbed 406 m over the last 10.9 km. It’s a climb that takes you right up onto the top of the moors and took us away from the coast for the first time in our trip. Eventually we did find our way down the final descent and into Woolacombe. Fortunately just long enough before sunset too, so that we could scout out a suitable bivvy spot. Bivvy spot scouted out and stored in memory for later recall we headed into town for some food. 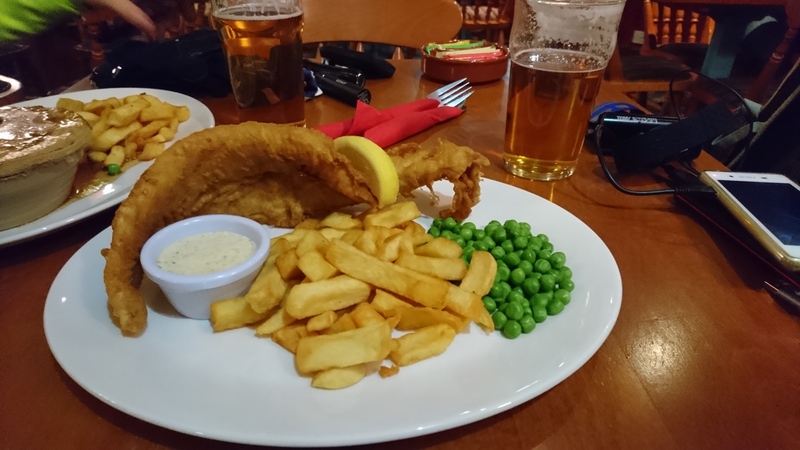 The Red Barn Bar & Restaurant provided us with our much needed dinner and a few pints of St Austell brewery’s Proper Job IPA. It also gave us a much needed warm up, the second half of the day had been noticeably cooler, with the sun having gone behind the clouds and a sudden chill in the air. Sat drinking the final pint of Proper Job, we were slightly dreading having to venture back out into the cold and wind of an October seaside night. But a few pints of beer always makes the air that little bit warmer and our chosen Bivvy spot was sheltered enough to keep out the worst of the wind. 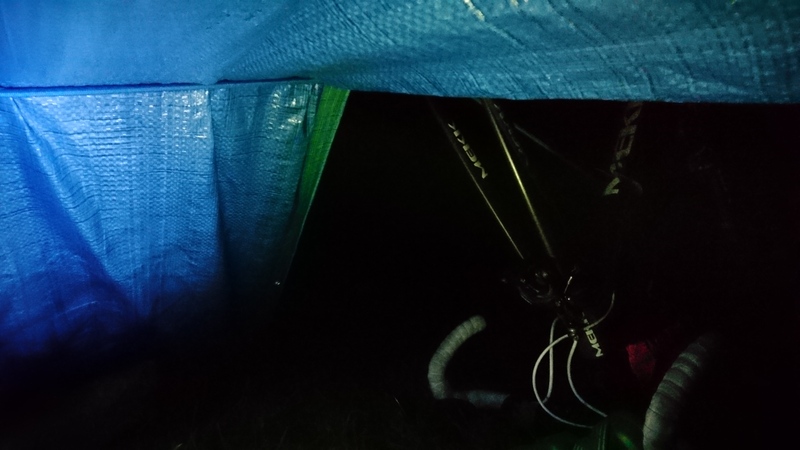 After a couple of attempts at different arrangements, we eventually settled on my tried and tested method of lashing a tarp across between the two bikes to provide some rain cover for the night and with some expert wriggling to get into Bivvy bags and under the cover of the tarp, settled down for some sleep. With over 2300 m of climbing and 120 km completed on day 1 we needed to get some rest for day 2 (the harder of the two days).